After much fierce competition with words like diaphanous, fuliginous, and mulligatawny, the winning word was: colloquialism. The spelling contestants included: Trinity Diaz, Evan Fuller, and Chayton Patterson from Big Pine; Morgandy Barker, Rose Bracken, Bryce Cokeley, Ashley Fitt, and Robin Linse from Bishop Schools; Ayden Baker, Kaedyn Hilliard, Aiden Kingsford, Sabino Palestino, and Perfecto Valdez from Lone Pine; Julian Carter, Kevin Glenn, Drake Martinez, Noah Reade, and Avy Reilly-Todd from Owens Valley; Madison Benniger, Rylee Delmas, Kyra Maberto, Greg Tordoff, and Bryce Winzenread from Round Valley. Several students also joined the preliminary competition as alternates to get practice for next year: Branden Gardea from Bishop, as well as Jade Griego and Evelyn Thornburg from Owens Valley. The local Altrusa chapter sponsored the competition. They brought cash prizes and trophies for the 1st, 2nd, and 3rd place winners, along with $10 gift cards to Spellbinder Books for all participants. Andrea Shallcross, Valerie Higgs, and Cheri Stewart attended to judge the competition distribute awards to students. Lynne Almeida and Ilissa Twomey graciously fulfilled the positions of Final Competition Pronouncer and Preliminary Competition Pronouncer respectively. Representing Inyo County at the Elementary State Bee in May will be Madison Benninger and Kevin Glenn. 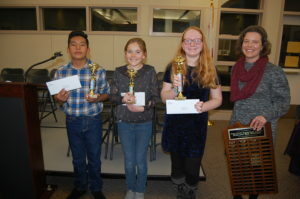 Rose Bracken and Ashley Fitt will represent Inyo County at the Junior High State Bee in May. Congratulations to all the student participants!